Stenocarpus salignus Red Silky Oak or ‘Beef Scrubwood’ is a slow growing tree that will reach 30m although often much smaller. Stenocarpus salignus will grow to form a uniform rounded crown and has nice narrow glossy foliage, the tree is covered in small white flowers in summer that are attractive to birds. 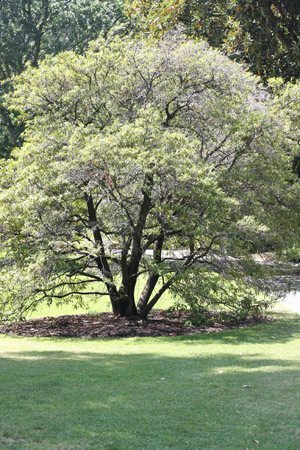 Over time it will form a dense crown will provide shade in the garden and as long as the soil is well drained, yet with some good humus content this is a very easy care tree. Grows well in full sun to part shade, Stenocarpus salignus prefers some moisture. This is a species that is found in warmer climates,where its natural range is for New South Wales through to Queensland. In these warmer climates, growth rate is faster that in cooler areas. Country of Origin – Australia – NSW- QLD coastal rainforest areas. Climate Zones – Warm Temperate, naturally growing in rainforest areas. Soil – Tolerates a range of well drained soils. Spread – Spreading crown to 7 metres plus. Foliage – Glossy deep green. Frost tolerant – Will tolerate light frosts only. Root system – Regarded as non – invasive. Not widely found in nurseries.